Tracing Hanukkah's U.S. Roots ... To Cincinnati? The Jewish community began reinventing Hanukkah in the late 19th century when the culture of Christmas also began shifting in America. The holiday became a way for Jewish children and families to celebrate a holiday when other Americans were doing the same. Tracing Hanukkah's U.S. Roots ... To Cincinnati? 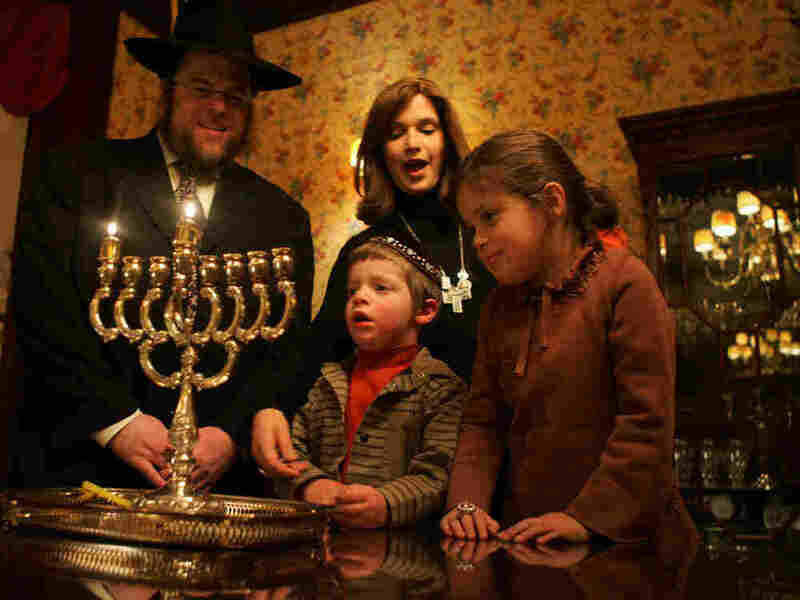 Rabbi Joshua Metzger, his wife Brocha, and their children Menachem Mendel and Sarah Perel stand by a menorah on the first night of Hanukkah in 2005, which fell on Christmas Day. Hanukkah, which begins Wednesday, is a fairly modest holiday in Israel and many other Jewish communities around the world. But it gained a much more prominent status in the U.S. after a couple of Reform rabbis decided to make it a little more Christmas-like in the late 19th century. Dianne Ashton, professor of American Studies at Rowan University in New Jersey, says the religious culture of the U.S. began to change after the Civil War. That led to the evolution of the type of holidays Christmas and Hanukkah had historically been. "There was a lot of social change, urbanization, industrialization and migration," Ashton tells NPR's Steve Inskeep, adding that people in the U.S. began to think that "sentimental home celebrations would help to stabilize all of the social changes." This came at a time when marketing was emerging and the U.S. economy was beginning to produce more and more consumer goods. Ashton, who is writing a book about the history of Hanukkah in America, says this paved the way for the rising middle class to display their wealth. "And so customs for Christmas became wrapped in this garb, and you get Christmas presents under Christmas trees," Ashton says. There is nearly no record of people celebrating Hanukkah just a couple of centuries ago. But it began to be an important Jewish holiday in the second half of the 19th century when two rabbis in Cincinnati noticed their Jewish children didn't have much connection to the synagogue. They didn't see Christmas as something they could do easily because it's Christian, but they did want to do something like that because it was American. The rabbis developed a new celebration for children during Hanukkah that was held in the synagogue and included giving presents. National newspapers publicized the new celebration, and it was soon being celebrated all around the country. Hanukkah was being reinvented at a time when the American culture had a booming holiday in Christmas. The Jewish community began to reshape Hanukkah as something their children and families could do when American families were doing the same thing around Christmas. Ashton says it was a way for the Jewish community to be a part of something that was happening in America. "They didn't see Christmas as something they could do easily because it's Christian, but they did want to do something like that because it was American," Ashton says. Hanukkah began to change again between 1880 and 1920, when more than 2 million Jewish immigrants came to the U.S. from Eastern Europe. "It became an occasion for them to do activities in the U.S. that they really couldn't do freely," she says. "They had concerts in public halls, and restaurants had Hanukkah specials." Ashton says there were even kosher restaurants serving turkey dinners, another American custom.